Full casting has just been announced for Peter Pan at Regent's Park Open Air Theatre which runs at from 24th May -15th June, with previews from 17th May. Timothy Sheader will direct the revival of his 2015 Olivier Award-nominated production with Fiston Barek (King Lear, Old Vic) in the title role, alongside Dennis Herdman (Around the World in 80 Days, UK tour) as Captain Hook, Cora Kirk (The People Are Singing, Royal Exchange) will play Wendy, Theo Cowan (Absence of War, Headlong) will play John and Omari Douglas (Five Guys Named Moe, Marble Arch Theatre) plays Michael, Puppeteer Elisa De Grey (Vivaldi's The Four Seasons A Reimagining, Sam Wanamaker) plays Tinkerbell, with Caroline Deyga (Our Ladies of Perpetual Succour as Smee. 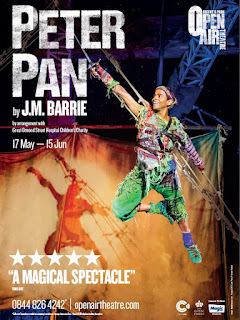 The cast also includes Sam Angell (Twin), Raphael Bushay (Nibs), Fred Davis (Twin), Lewis Griffin (Tootles), Willy Hudson (Curly), Arthur Kyeyune (Pirate), Kyle Lima (Starkey), Tim Preston (Slightly), Louis Quaye (Pirate), John Sandeman (Pirate) and Ed Wade (Pirate). The production has set design by Jon Bausor, costume by Jon Morrell, puppet design and direction by Rachael Canning, composition and sound score by Nick Powell, lighting by Rick Fisher, sound by Nick Lidster, fight direction by Kate Waters, casting by Polly Jerrold and musical supervision/musical direction by Candida Caldicot.